I would say Finn’s journey to finding relief with Neocate® Syneo® began at around 3 weeks old. Finn was breastfed since birth. Aside sounding like he was congested in his breathing and crying somewhat more than his older brother did as an infant, he seemed like an overall healthy, happy newborn. At around 3 weeks old, Finn started to get what we thought was just bad baby acne that flared up periodically. Around 2½ months is when his symptoms started to escalate further. He had colic more frequently, for 2-3 hours a night. He didn’t want to be laid down to sleep and was waking every couple of hours in distress. He also seemed like he was having bowel discomfort. He wanted to nurse constantly for comfort but would quickly change his mind and cry in pain. His eczema was starting to get worse on his head and cheeks. Our pediatrician suggested an over-the-counter hydrocortisone cream for his eczema, but we saw no relief. At 4 months, we were referred to a dermatologist and began seeing her every two weeks. Various topical steroids were prescribed, and the eczema would fade slightly, but still had no lasting effects. At this point, his scalp and cheeks were covered in weeping eczema. He was constantly rubbing his head to try and itch when he was laid down, sometimes until it would bleed. We tried every kind of swaddle and scratch prevention sleeves. Finn still found a way to rub his head and his cheeks raw. It was all very heartbreaking. The nights were hard. I felt so guilty for what he was going through and also for wishing time away. I was just hoping that he’d eventually grow out of it and find some relief. After doing some research, I began to wonder if his symptoms could be food-related. The dermatologist was insistent that some babies just have eczema and his was not connected to allergies. But his bowel movements were at times full of mucus and he was still crying in discomfort in the evenings and after nursing. After discussing with our pediatrician, we were referred to a GI specialist. While we waited for our appointment with the specialist, I decided to remove dairy and soy from my diet. He was also placed on a medication for acid reflux. We saw the GI specialist when Finn was around 5 months old. After hearing that I had already attempted to cut out dairy and soy from my diet for about five weeks with little change in his symptoms, gastroenterologist suggested putting Finn on a hypoallergenic formula to try and find a baseline and give Finn some relief. We also started him on a probiotic. We tried the first formula that was recommended (not Neocate) for about two weeks. We noticed some relief in his flared eczema and sleep routine but saw no drastic changes to his symptoms. Meanwhile, I had done some research and found, Neocate, an amino acid-based formula with no ingredients derived from dairy and soy. After discussing with his GI specialist, we switched Finn over to Neocate Syneo. After about six months of trial and error, we finally saw relief in his symptoms within a week of starting Neocate Syneo. Finn did a complete 180. And within three weeks, it was as if someone came into my house and replaced my son with a happy, relaxed, content baby. For the first time since he was a newborn, I could rock Finn to sleep at night without him screaming and crying in pain. I cried many happy tears instead. Finns’ skin went from being covered in weeping, bleeding eczema, to clear and baby-soft skin (also with the help of an antibacterial cream for his infected cheeks). He began sleeping in 6-8 hour stretches and was waking up happy instead of in distress. The congestion he’s had since he was an infant was gone. I could lay him down awake and he would fall asleep on his own. I was so relieved and elated for his new quality of life. Finn’s GI specialist thought these improvements likely meant he has an intolerance to dairy and possibly soy since those are the most common in babies, but I wanted to be sure since we were starting solids and I had noticed signs of a slight reaction to certain pre-packaged baby foods. So at 6 months, our pediatrician referred us to an allergist. 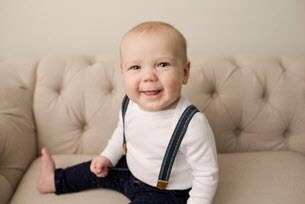 Finn’s allergy testing was done at 9 months and revealed reactions to eggs, dairy and peanuts. In addition to these allergies, we also believe he has a possible soy intolerance as well, because he does react with bowel discomfort and eczema when he consumes it, but it did not show up in the allergy testing. We’ve also tried a standard amino acid-based formula, one without pre- and probiotics, instead of Neocate Syneo on two separate occasions but his eczema and bowel discomfort does seem to return. We still have a long journey to understanding what Finn is sensitive to and how his allergies will evolve as he grows, but there is so much security in knowing that right now, Neocate Syneo works perfectly with Finn’s system and he is a healthy, happy baby. We are so grateful for the quality of life he’s been given because of it. Neocate® is a family of hypoallergenic, amino acid-based medical foods. Neocate is intended for use under medical supervision. Neocate Syneo Infant is indicated for the dietary management of cow milk allergy, multiple food allergies and related GI and allergic conditions, including food protein-induced enterocolitis syndrome, eosinophilic esophagitis and gastroesophageal reflux.